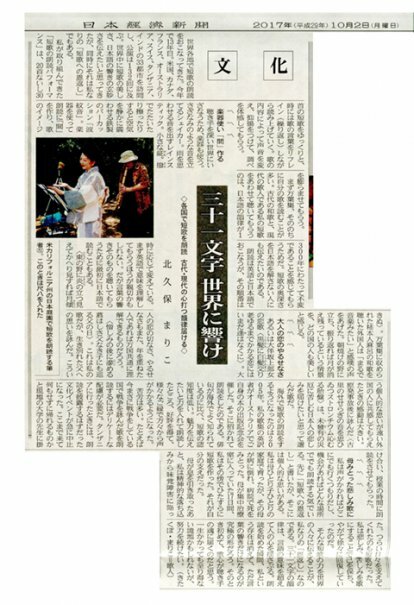 ﻿ Media coverage and appearance:　Contemprary Tanka Poet Mariko Kitakubo. Contemprary Tanka Poet Mariko Kitakubo. Media coverage. Colorado Boulevard.net posted my English tanka in its corner, "A Quiet Place." 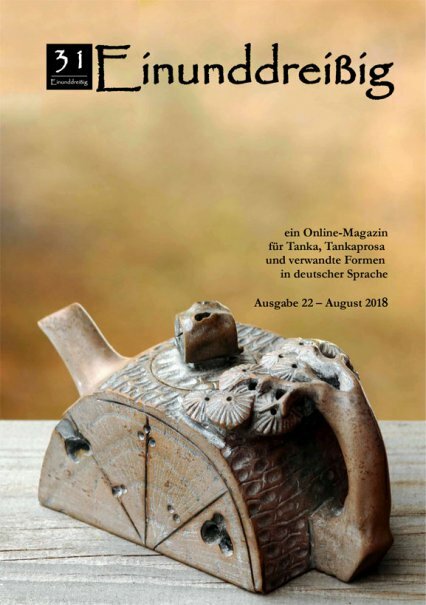 10 pieces of my English tanka selected from my anthology "INDIGO" were translated into German, and posted in the August issue of online poetry journal, "Einunddreissig". Please refer to 7 - 9 pages of the pdf version from the url below. You can also read the article in the Einunddreissig website. I would like to express my sincere gratitude toward everyone in Einunddreissig who picked me up and translated my work into German. Ms. Valeria Barouch, one of the editors of Einunddreissig , thank you very much. 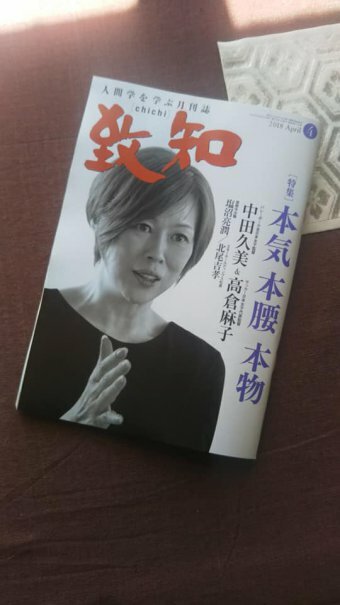 Monthly magazine "CHICHI" posted my interview article in its 2018 April issue. I started studying Tanka about 25 years ago when I was in the thirties. Now I travel around the world as a poet & tanka-reading performer, I cannot help but feel the wonder of life. Thanks to many people’s help and assistance, I have been able to present 145 times of reading performance in 34 cities in the world to date, and I composed about 8,000 pieces of tanka. The reason that I started composing poems was I wanted to send a message to my father from whom I was parted when I was small. However, I found out he had had passed away when I was a highschool student. I completely lost a way to tell my gratitude or apology directly to him. Tanka was one way to express my emotion which had nowhere to go. Although tanka cannot deliver a lot of things because it is composed of only 31 syllables, it is easy to write down no matter where I was. Because of this, I was able to compose tanka while doing housework and childcare. Literally, tanka came in to my life. I wrote about my son’s growth with his changing voice. When I wrote about how I felt while raising my son, toughness and joy, I still remember I was very much relieved. Being different from sports or study, Tanka does not have a clear-cut method to master the technique. Read as many tanka as possible, and experience the emotion by oneself - this is the only way to improve poet's skill. Luckily enough, I had an opportunity to be under Mr. Yukitsuna Sasaki’s tutelage. 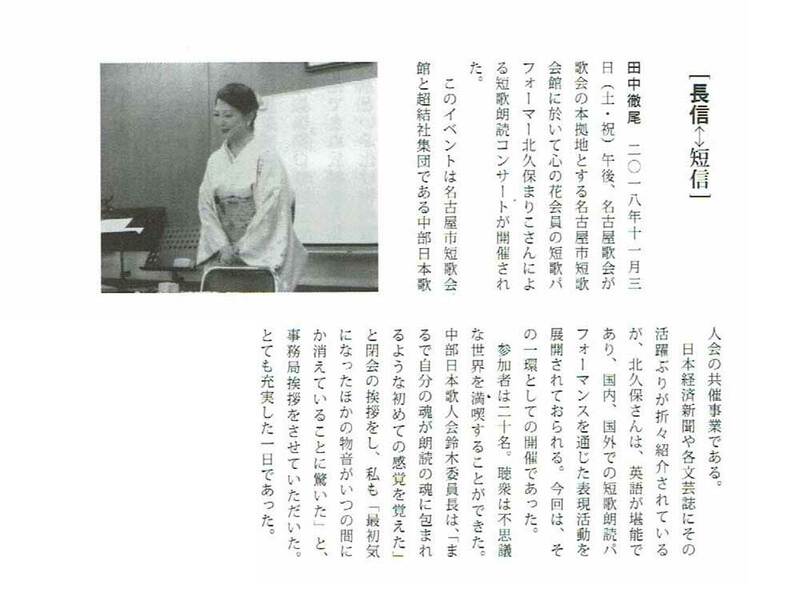 Mr. Sasaki preside over “Kokoro-no-hana”, a tanka organization with more than 110 years of history. His tanka is filled with masculinity and strength. I learned a lot from his works – energy, sensitivity, and so on. In 2002, one of my fellow tanka poets invited me to a tanka-reading event, “Marathon Reading”. After this, I went into tanka - both writing and performing reading - more and more. I happened suddenly. My mother passes away in the following year. I fell into deep sorrow because I was not able to share my feeling with anyone else - most of my relatives were deceased and I was a only child in the family. Again, it was tanka which supported me in those days. While I write tanka, I felt being relieved of my worries. It was like passing my sorrow and trouble from deep inside my heart to poem I create. Let me introduce you the pieces I wrote in those days. 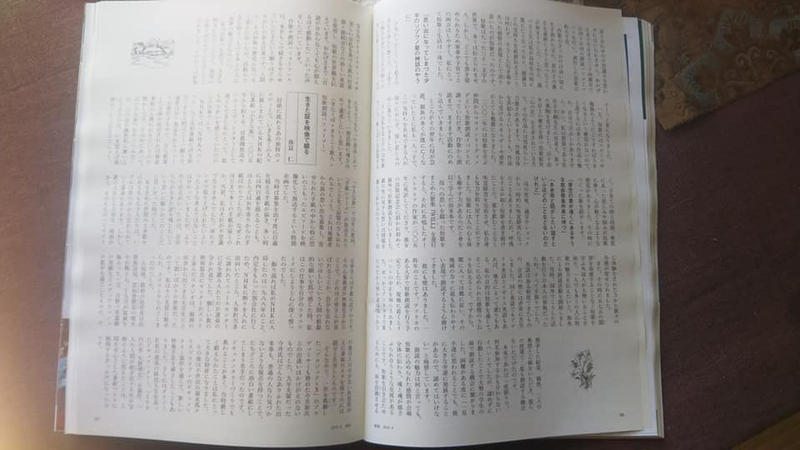 Although I was temporary suffered from taste disorder due to overfatigue and severe stress after my mother’s death, I had kept writing tanka as if breathing, and I was able to overcome dysgeusia without any medication and regained mental vitality. I, myself, both physically and mentally, experienced the healing power that tanka has. I published an anthology, “WILL”, which is composed of the pieces with my affection to my mother. In 2005, an Australian writer, who empathized for “WILL”, translated my tanka into English. She invited me to her publication party, where I was given an opportunity to perform tanka reading. It was my first reading performance overseas. The emotion we experience at death of the parent is universal. We all share the same feeling no matter where we are born. I received many comments with empathy. 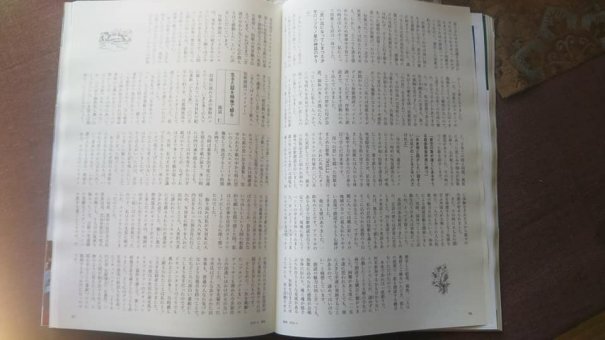 At the same time, I found out that there are many non-Japanese people who learn tanka without experiencing 5-7-5 meter. I wanted to deliver the beauty of tanka as many people as possible. This is the reason why I started bilingual tanka reading performance. In those days, there was no Japanese person doing this kind of activity overseas, therefore, everything was try and error. I was able to make myself understood in English at that time, however, I faced a lot of difficulties because of the language barrier. American English, British English, and unique pronunciation or phrases in different areas, and so on. The purpose of my activity is to deliver the undulation of emotion in tanka through my reading performance. Therefore, I have always been trying to find the best way to communicate with the people wherever I went. Language was not the only barrier I faced. Two years ago, I was scheduled to perform tanka reading at an event in an African University. However, I arrived there only to find the cancellation of the event. “Well, having been in Africa anyway, there should be something I can do,” I thought. Luckily, I was introduced to two professors there, and had given opportunities to perform bilingual tanka reading in their faculties – two times in total! If the event have had taken place as scheduled, I would have had perform reading only one time. And, I had no idea how many people would come to the event. My action led me to the better result. When facing a difficulty, even if the situation seems to unfavorable, a step move forward may turn out to be favorable outcome. I believe in it from the bottom of my heart. Being a tanka poet and a performer of tanka reading is a worthwhile job, and I wish I could have the same job if I reborn in the life to come. The lifetime of a human is a lot shorter than that of tanka, therefore, I would like to deliver the beauty of tanka as many people as possible as long as I am able to continue this activity. Tanka has been helping me to live my life peacefully without suffering from any sever illness. I would like to strive for my activity even more from now on so that I can return favor to tanka for its support to me. 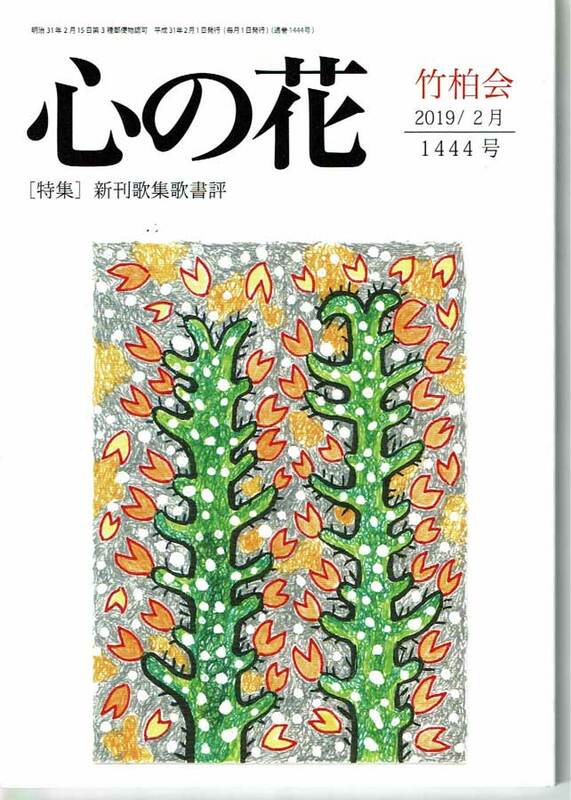 To move to Monthly "CHICHI" magazine, click the link below. 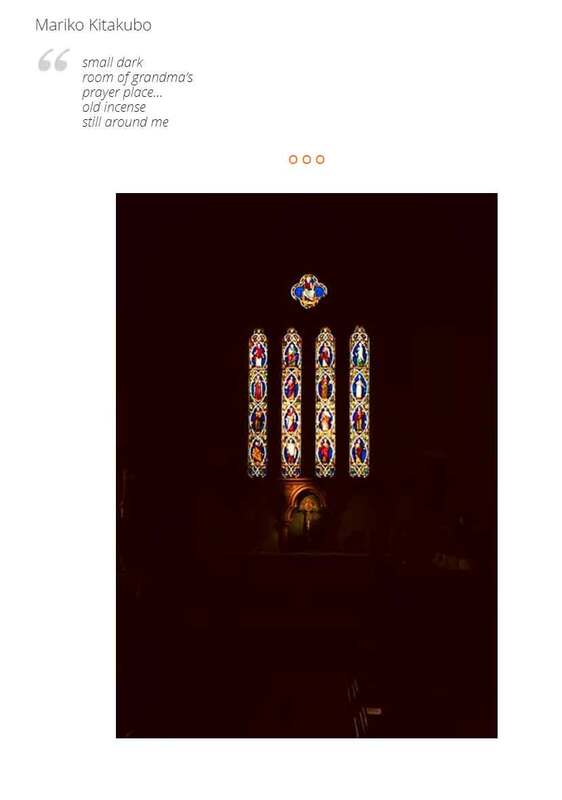 Click the url below to move to the latest edition of Monthly Magazine "WENDY". Below is the translation of the article. It was in 2005, almost 12 years have passed since I started composing TANKA, I decided to introduce TANKA overseas by my reading performance. This year is the 13th year of my bilingual TANKA reading performance activity overseas, and I did 134 sessions so far. It was my anthology, "WILL", that brought me an opportunity. It is my third anthology which I compliled to memorialize my deceased mother, who raised me as a single parent and passed away suddenly due to subarachnoid hemorrhage. Ms. A. F., an English poet in Sydney, was deeply impressed with it, and asked me to perform tanka reading at her publication party. September 2005, my first TANKA reading performance finished with a very big applause of audience in Canberra, Australia. One beautiful elderly lady come to me and told me, "the language of your country sounds so beautiful as a piece of music!" I have never had such an idea until she told me so. Her comment gave me a delightful suprise, and have been motivating me to continue my bilingual reading performance activity. Even those who have interest in the Japanese literature are able to touch upon MATSUO BASHO or MASAOKA SHIKI only through translated versions. Why don't I deliver the Japanese unique sound and meter which has been succeeded over thousands of years! I made up my mind at that time. My bilingual TANKA reading is composed with about 30 pieces of Japanese poems, all which have universal themes that anyone can empathize regardless nationality, religion, age or gender. I read them in Japanese and in English, taking the appropriate time while playing sound instruments by myself. Usually I select poems of elegy and love from MANYO-SHU, as well as my own piece which pray for the world's peace. My eternal goal is to depart from "individual" of being myself and to become a "medium" to convey ideas from soul to soul. I would like to make continuous efforts to deliver the words breathed life to the audience. I believe that TANKA has a power to sublime negative emotions such as pain and sorrow, and to heal the person who writes it. Beause of this power, I was able to hold myself together for the last 17 days until my mother passed away. She fell down suddenly and turned into vegetative state. I sat down at my mother's bedside, and kept writing TANKA day in and day out as if breathing. I did all the procedures needs to be done after my mother is gone by myself. Of course, all of them had certain leeway until the due date, however, there were many documentations I had to process. I had no time to rest and struggled with papers. Literally, there was no time for cring. After a while, I finished all the procedure. I took a breath, and remembered I had not been eating anything from the morning. I dropped by at an archaic Japanese noodle shop and ordered ZARU-SOBA. Although the sauce for soba noodle was dark enough, it tasted as light as consomme soup. The other customers looked satisfied with the food. They enjoy their meals while happily talking with accopanying persons. I was tired, and I did not want to bother with complaining about the taste to the shop-person, therefore, I added extra soy sause to adjust the flavor. When I almost finished my meal, I realized that it is not the shop, but me, that had trouble. I was suffering from taste disorder. Since then, I have been trying to take rest consciously, and spending time by creating poems with the emotions piling up in my mind. Fortunately, my taste disorder did not last long. It was TANKA which supported me all the time. It can be said that I am returning a favor to TANKA by travelling alone and introducing TANKA overseas. Not to insist on my own ideas, but try to adapt myself to others. It is my belief. If I become too self-assertive overseas, people may feel not only myself but also TANKA is something self-centered and pushy. Sometimes I encountere with the situation which require extra efforts. In many countries, my reading performance in English is understood as is. However, in the area in Switzerland bordering to Germany, I had to change the pronunciation particular to the area. Much patience was required, to be honest, but there was no other choice. There is no meaning to perform TANKA in English unless they understand. In April two years ago, I visited Tanzania after 15 years. I was invited to the event to introduce Eastern Asian Culture held in Dodoma University in the capital. I fell into the unforeseen situation two days after I arrived in Tanzania. I received a cancellation notice of the event when I was in Dar es Salaam waiting for a flight to Dodoma on the following day. Well, that' life. Unexpected things may happen during travelling, regardless good or bad. It's no use resenting. I departed to Dodoma, anyway. Ms. S, a Japanese teacher at the university, who bridged between the university and me, apologetically made a bow to me. It was not her fault. We exchanged the greetings of our first meeting with smile, and discussed what we could do. "It's kind of rare to see two Japanese ladies here. Are you planning something fun?" A tall, agreeable young gentleman talked to us at the door. He is Mr. M, the professor of literature of the university, and a friend to Ms. S. When we explained about the circumstances, he said to me, "If it is okay with you, could you perform bilingual TANKA reading in my class tomorrow morning?" Of course, I agreed to his offer right away. Right after Prof. M. left us, Prof. L of linguistics dropped by. "Did something good happen? ", he said and gave me an offer. "Could you introduce 'TANKA' in my workshop the day after tomorrow?" What an unexpected development! If the event had taken place as scheduled, I hadn't been able to meet these two Professors. It was literally a good fortune for me to have had opportunities to introduce TANKA to many young generation in Dodoma. Inscrutable are the ways of Heaven. If I did not go to Dodoma after receiving the cancellation notice of the event, I would not have had this good fortune. I would like to keep gratitude to others always in my mind, and continue to seed TANKA all over the world. "Writers association for abandoning-nuclear-power society" newsletter Vol. 11. 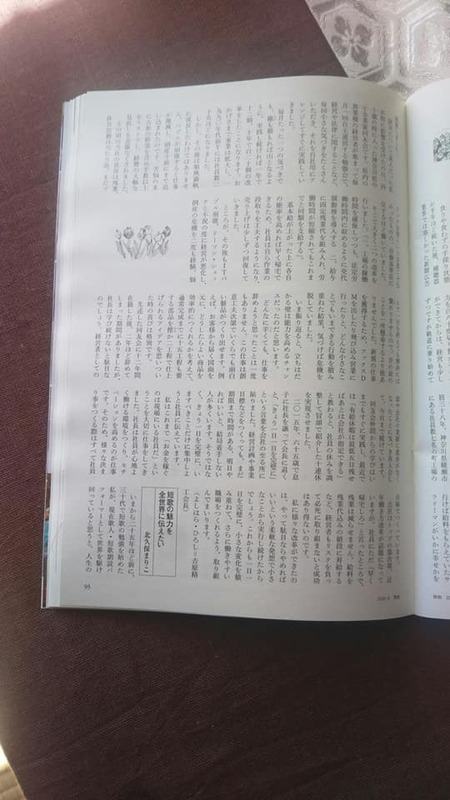 Newsletter of "Writers association aiming for abondoning-nuclear-power society" Vol. 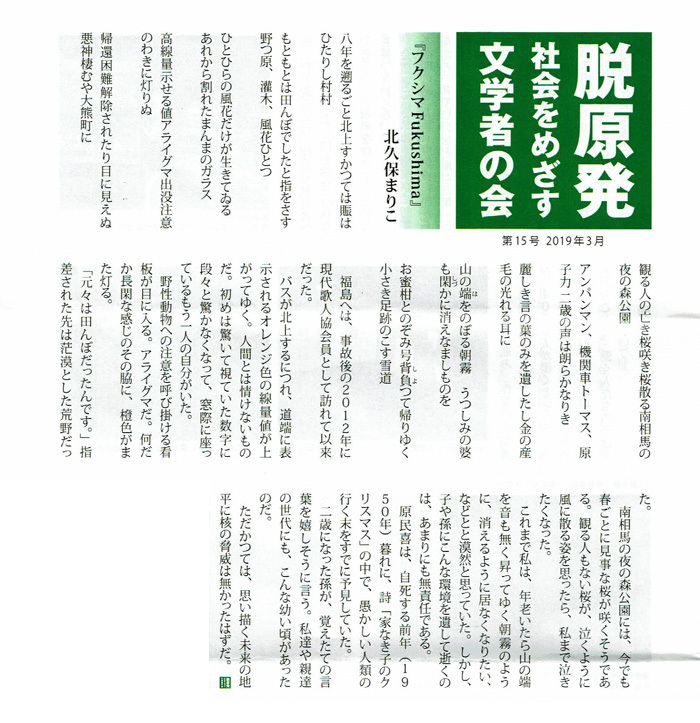 11 issued in Nov. 2017 posted my article about my participation in "Hiroshima Memorial Event in Maruki Museum this summer. 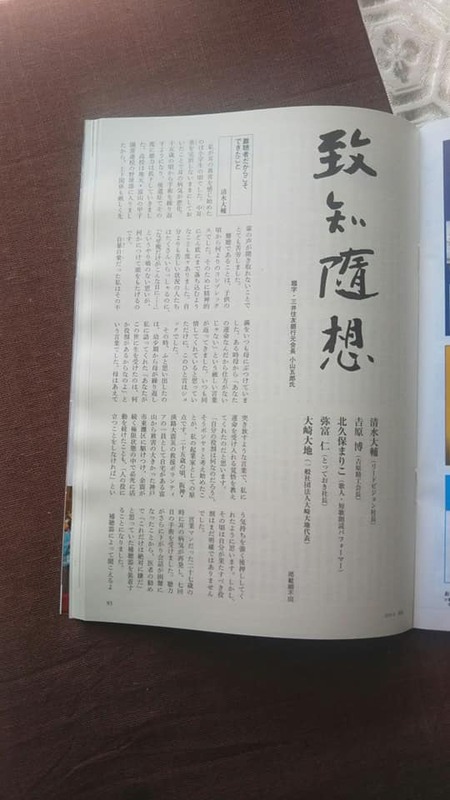 Japanese newspaper, Nihon Keizai Shinbun, posted my interview. 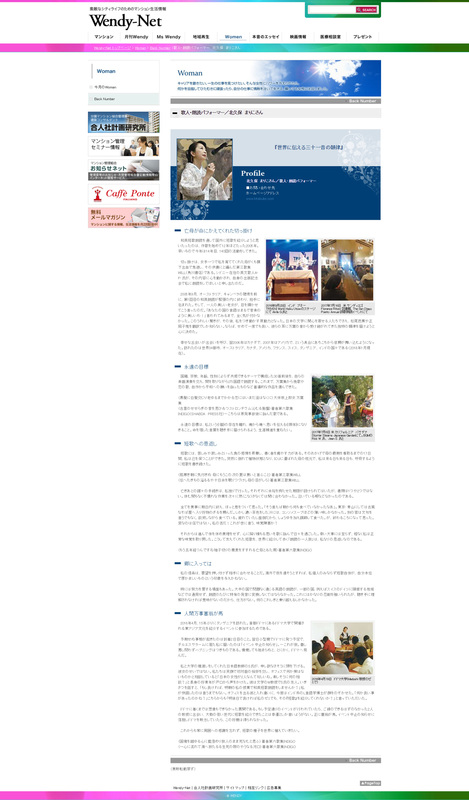 English translation of the article is available below of this page. Nihon Keizai Shinbun newspapser, Oct. 2nd issue. Tanka reading performance overseas to deliver the prosody of historical and contemporary poetry that touches the audiences’ heart. I have been presenting Tanka reading performance in many places around the world. This year makes the thirteenth year for my activity. Visited 33 cities in the United States, Canada, France, Australia, Switzerland, Tanzania and India, I performed 132 times of Tanka reading to date. Although my main motivation is to deliver the beauty of Tanka as well as the profoundness of the sound which the Japanese language has, my activity also has an aspect of "returning the favor to Tanka." In my performance, I read out twenty to thirty pieces of Tanka, slowly, and sometime refrain words in the poem. I change the vocalization according to the content of the poem, attaching intonation so that the audience can experience the beauty of the sound. Use musical instruments to create "intervals"
I also use instruments to invite the listeners to a deeper world. A shaker makes sounds like ripples. A rain stick makes a sound reminiscent of rain. Small bells. And, iron-made percussion, "Hamon", which gently vibrates air when it is beaten or rubbed by drumsticks. These instruments are used to create some intervals so that the listeners are able to expand their imagination about the poem. Most of the time, I perform reading poems from "Manyo-shu" at first, followed by my own Tanka pieces. I would like the audience to feel unchanging sound of the Japanese language even today 1,300 years after the Manyo period. This is the reason why I perform ancient Tanka poetry together with my own Tanka. I would like to deliver the deepness of Tanka to the people who do not understand Japanese. I perform reading both in English and in Japanese. I change the order of the languages according to the situation. It may be more kind to offer English version first because they are able to understand the meaning of it. However, when I wish them to focus on the sound of the Japanese language, I read Japanese Tanka before its English version. 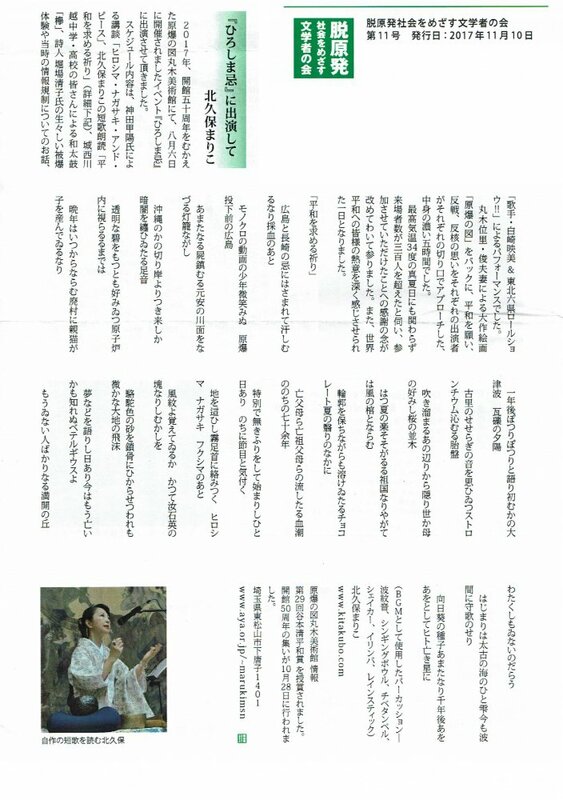 When a non-Japanese audience heard this piece of poem written by Kakinomoto no Hitomaro contained in "Manyo-shu". She was so marveled and said, "It sounds as if a piece of music." Standing in the field of morning glow, you look back and find lingering moon - we feel this scene is beautiful regardless nationality. Painfulness and heartrending sadness of adults romance may be another example of feeling which can be understood commonly especially among the aged people. I wrote this piece with my emotion toward my father from who I parted in life. I am deeply impressed when I find non-Japanese person show an empathy toward this sort of my personal emotion. This is another piece of my Tanka which I selected to convey the sadness of Japanese suffering from unprecedented calamity. I started Tanka reading performance overseas in 2005. I was invited to the publishing party in Australia and performed Tanka reading when the translator of my anthology published her own book. Compared with Haiku being well known abroad, the recognition of Tanka is low. I simply wanted to convey the charm of Tanka, therefore, I did the reading with full expression. 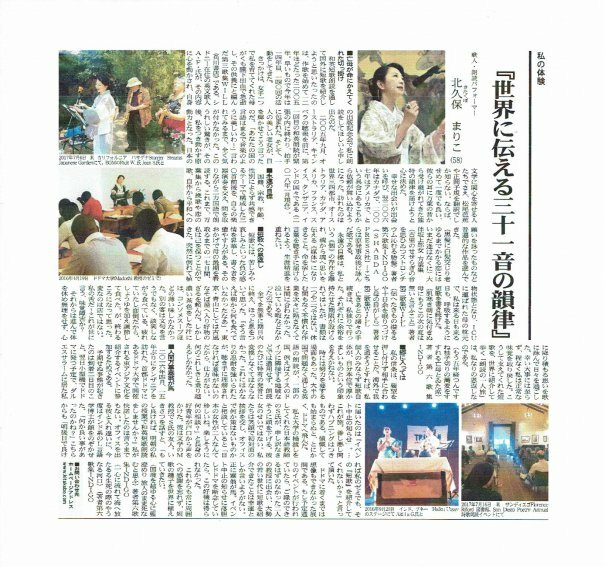 The audience showed favorable reaction toward my performance, and I started receiving requests to do Tanka reading from many different people. There are many hardships. For example, delicate consideration is required to perform reading Tanka with the theme of conflict in the countries currently in war. When I visited Tanzania, the cultural event, in which I was scheduled to perform some reading, was suddenly canceled. I thought I could not go home without doing anything after all the way to come to Tanzania, I negotiated with a professor in the university and got some opportunities for me to present Tanka reading in class. I am willing to go anywhere to present reading performance whenever I have opportunities. In the beginning, I wrote "returning the favor to Tanka", and there is a special and personal emotion attached to it. I grew up in a mother-and-a-child family. She got ill, and passed away in the hospital. While she was in intensive care unit for seventeen days, I was by my mother's bedside, and devoted myself to write Tanka. Writing Tanka was a spiritual support for me at that time. After she breathed her last, the huge sense of loss made me taste disorder. However, again, it was Tanka that supported me in my tough days. I put my sorrow and painfulness into my Tanka, which helped me a lot to hold myself. And gradually, I was recovered. To pass on the power that Tanka has is my way to returning the favor to Tanka. Thirty-one syllables are not just the words with meaning. They touch and move the heartstrings of the listeners. At the moment I start reading, my existence disappear and only the sound of words remains - it may be the ultimate form of reading poetry. I believe it is the moment when the emotion in the poetry touches the heart of the listeners. I may not be able to reach such a stage in my lifetime, however, I would like to make efforts to come closer to it. Photograph: Mariko Kitakubo performs Tanka reading in Storrier Stearns Japanese Garden, Pasadena, California. Shakuhachi, a Japanese bamboo flute, played by Mr. R. Wilson. Two pieces of my English Tanka are posted in the Poetry Corner, theme "Protesting Our Enviroment" in Colorado Boulevard.net.